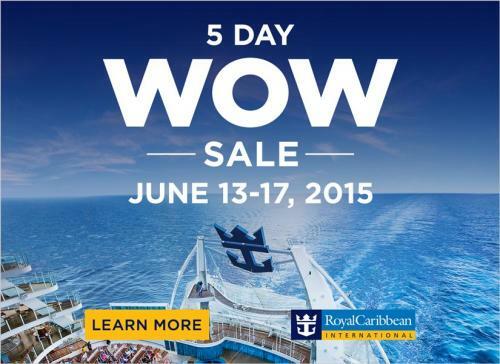 Royal Caribbean will kick off a five-day WOW sale starting June 13, 2015 that will run through June 17. The sale offers up to $200 onboard credit and 50% off deposits in addition to the 30 FOR 30 sale that is ongoing. The WOW sale is valid on all sailings departing on or after July 13, 2015, excluding China departures. Offer is combinable with standard/full fare and restricted rates (for example, Seniors, Residents, Military, BOGO, etc. ), Next Cruise, weekly Sales Events, and Anthem Upgrade offers. Offer is not combinable with any other offer or promotion, including, but not limited to, Interline, Travel Agent, Travel Agent Friends and Family, Net Rates, Crown & Anchor Discount programs or rates. Offer is available to residents of the United States and or Canada. What is a WOW Sale? Are WOW Sales good deals? Read our Cruise 101: WOW Sale post to get information on what this deal is all about.